Between the years: 1150 – 1500, Ferryhill was a thriving community. Within the township of Ferryhill, there included a wood, which was west of Ferryhill, a park surrounded by a wall, which is now the market centre, a water mill, and a windmill, which may have been the building that remains are in the west of Ferryhill. The priory of Durham held all these. The Abbey of Durham had a courthouse, which in the early 18th Century, was converted into a public house, a St. Ebbe Chapel and a St. Nicholas Chapel. There was also a swannery and a fish pool that was situated at Rudd Hill, towards Mainsforth. The hamlet of Ferryhill consisted of a small group of farming families that paid rent to the Abbey. In the Rent Rolls, are the names of: Richardson; Grey; Persone; Walyfield; Wylley; Rutter; Millet, and the Ferry (Fery, Ferie) family. It was an offence to sell beer bought outside the township, within the community. There were many disputes, taken to the Church’s court, about grazing rights and the repair of the milldam. Numerous fines were shortly imposed for driving knives with intent to strike. In the early 14th Century, William Trollopmen, of Ferryhill, was fined 40 pence for drawing his knife upon a fellow villager. It was an offence to play football inside the township. The penalty was 40 Shillings. It was said that it concluded into gambling and disorder, and interfered with archery. In 1256, ‘Fergenne’ became the new name for the township. It was a market garden for the Prince Bishops of Durham at that time. In 1316, ‘Ferye-On-The-Hill’ was the town’s third name. In 1346, the English and the Scots were fighting at the Battle of Neville’s Cross and Merrington was used as a camping site for the English. Robert Todd and Hugh Smyth, of Ferryhill, paid 36 shillings each, to the Abbey of Durham, for their right to mine coal outside the township. In 1539, all monasteries, during the reign of King Henry VIII, were suppressed, and Ferryhill, belonging to the Abbey of Durham, were transferred to the Dean & Chapter. Christopher Buchon late of Darlington, co. Durham, lab., on 24 April 1557 with force and arms broke and entered the close of Richard Laxe at Ferryhill and stole a web of linen cloth worth 7s." Between 1560 and 1569, there was a rebellion in Durham against the Elizabethan Church settlement. Some people joined the "Rising of the Northern Earls", who wanted Queen Elizabeth I off the throne, and supported, in her place, Mary Queen of Scots and the Roman Catholic Church. The prayer book and the English Bible in Durham Cathedral were destroyed. In Ferryhill, fifteen people joined the rebellion, and in 1569, four of which were hung. The Manor House in Ferryhill, now graded as Graded II Listed Building, is recorded around 1588. Laurence Wilkynson of Ferryhill, co. Durham, on 24 June 1599 assaulted Robert Kyrkhouse of Church Merrington at Ferryhill, striking him with a dagger held in his right hand on the left side of his head and putting him in bodily fear." n 1599, The Black Death plague reached Ferryhill, and 26 people died between the months of August and September. During the beginning of the the 17th Century, Ferryhill was just a small hamlet, with just five to eight houses in total. Thomas Atkinson late of Thinford, co. Durham, lab., on 12 Dec 1602 broke into the close of James Kay at Ferryhill and stole a wether worth 10d." Whereas the statute of 13 Richard II forbade the keeping of greyhounds by artificers, labourers and other laymen not having land worth 40s, together with ferrets, cords or other engines to take of destroy deer, hares, coneys and the like under pain of imprisonment for one year, John Wilkinson of Ferryhill, yeo., and John Dawson of the same, lab., being laity (etc.,) on 20 Dec 1603 at Ferryhill did use ferret and net to take and destroy coneys"
Thomas R[...], late of Little Chilton, co. Durham, Gen., John Highley of Great Chilton [...], George Morton ate of Little Chilton, Michael Dickinson, late of the same, and riotously assembled on 20 Dec 1603 at Ferryhill and injured John Wilkinson and John Dawson"
Laurence Wilkinson late of Ferryhill, co. Durham, on - Dec 1603 at Ferryhill was a common brawler and disturber of the King's peace"
In 1599, The Black Death plague reached Ferryhill, and 26 people died between the months of August and September. Captain J Shaw was the new owner of the Manor House. The Charles The First and Parliament Civil War split Ferryhill into two sides. Mr L Brock suffered 200 pounds worth of damage at the hands of royalist troops. Parliament won the war, and Mr Shaw had his estate seized. In 1629, Dial House, Durham Road, Ferryhill was recorded as being built as a coaching house. In the late 19th Century, it was converted into a private family home, for the Stephenson Family, who owned two businesses: a Joiners, and Undertakers. It was demolished in the late 1960s. In 1653, Nov. 28, James Crosby and Anne Grey, of Ferryhill, were married at Merrington Church. Murder - In 1683, Jan. 25, Andrew Mills, a servant boy, murdered his employer’s three children at Brass Farm – now High Hill House farm- between Ferryhill and Spennymoor. Mills was gibbeted, half to a three-quarter mile north of Ferryhill. The children were buried in an alter tomb in Merrington Churchyard. The murders created such coverage that even a press office in London did a press story on it in the same year. During the 18th and 19th Centuries, the poor of Ferryhill were helped by different charities. In 1729, Morgan’s Farm was built in the town centre of Ferryhill, now North Road, next to the Public Library. 1749. Aug 22. Luke Hudson killed in a combat near high-butcher-race, bur. (buried)"
In 1765, Jul. 2, an archery competition was held in Ferryhill. The competition was national and was called the ‘Golden Arrow’, founded in 1673. There were 20 competitors, but the final was between Thomas Watson, of Darlington, and Thomas Kelly, of Richmond. Mr Kelly won the competition. 1801. The Arrowsmith family now owned the Manor House. The coal trade was recorded in Ferryhill, in 1821, when Mr Thomas Arrowsmith’s works were providing employment that attracted other workers from the outlying villages. The Cut, Ferryhill, was originally, planned to be made into a coach road as early as 1832, because of the conditions for horses using Durham Bank. It was in the enterprise of ‘Turnpike Authority’, which hoped to recoup the cost of tolls charged. However the scheme was dropped, following the development of Ferryhill railway. Durham County Council made further plans to develop the cut into a highway in 1913, but was cancelled due to the outbreak of the First World War. Ferryhill railway, in 1834, used the Gap for it’s mineral line from Port Clarence to Coxhoe, by theClarence Railway Company. The Newcastle & Darlington Railway, in 1844, ran another line alongside, using the same natural Gap in the hillside. Some 100,000 abic rocks were removed to obtain the required width and gradient. In 1872, the selection of line was opened to passengers. In June 1887, there was the opening of the island station, at a cost of £13, 612. The station closed in 1967, and demolished in 1969. In 1840, Ferryhill Railway Station was built to service a population of 850. In the same year, Ferryhill Station Goods Yard was opened, and was once referred as being the busiest goods yard in the North of England, and during the Second World War, that same goods yard housed all the stock from York. Ferryhill Windmill, west of Ferryhill, was original built around the early 1840’s. The Mill was constructed with dolomite (magnesium limestone), which was quarried within four hundred yards away. The Mill, recorded in 1841, was called ‘Cow Hill Mill’; then later called ‘Hill House Mill’. It stands to the approaching farm road, but within the last few decades of the 20th Century, it was fenced off as it was considered dangerous because of its ruins and hazardous conditions. It became disused after 1903, after a devastating thunderstorm had crippled the foundation. There is a story, that the residents of High Hill House in the 1950’s or1960’s, had tried to pull down the mill with a rope and tractor, but the local council had stopped the operation for an unknown reason. 1843. Jul. 15, The Parish of Ferryhill parted company with the Parish of Merrington. The Vicarage of St. Luke’s Parish was built in 1846, seven years before the original church. William Cowburn, of Ferryhill, was recorded in 1851, as both the stationmaster, and the postmaster.Letters from the South always arrived at 5.15 A.M. every morning, leaving him to rush to sort the letters out until 8 AM, when letters came from Durham, and the North. In 1853, St. Luke’s Parish Church was built on its present site, in Church Lane, using the stones of the former church which used to be in the east end of the market square. The plans and specification by Mr Pickering of Durham were submitted to the Diocesan Authorities for there approval. In 1857, the main road from Ferryhill Village to the Station was laid. The original road used to run down what is now Gordon Terrace, which was the old Roman road from York to Durham. In 1863, the Zion Methodist Church was built. In 1867, the Town Hall was built as a library, reading room, and a concert hall. The building was erected on the site of some old cottages, provided by Reverend Simons, and the Elizabeth Morgan’s Charity. The cost of the building was £700, raised by public subscription. Repairs were carried out at Cleves Cross Farm, in 1867, where the remains of a pit were found. Experts were satisfied that this was the pit into which the Boar of Brancepeth was trapped before been slain by Roger de Ferie in the year 1208. In 1870, Ferryhill Mixed School was built with the house from the master: Mr J C Dodson. Within the same year the same school was enlarged at a cost of £577, to house 200 children. The North Eastern Railway engine shed, Ferryhill Station, was built in 1871, to house perhaps a dozen goods engines. The shed was closed in 1938, and demolished later on. In 1876, Ferryhill Station Mixed School was built at a cost of £5000, to house 400 children. Mr J Aitchinson was the headmaster. In 1877, the Primitive Chapel was built in the village for £840. The old Vicarage of St. Johns, outside Kirk Merrington, was built in 1879, two hundred yards east of the Church. This imposing red-bricked house, standing on a large chest of a limestone ridge, commanded magnificent views of the surrounding countryside. It was demolished in the late 1960’s, and a new vicarage was situated just within Merrington. In 1886, Duncombe Cemetery was built at a cost of £1700. n 1891, Dr. Falmer restored the Manor House. 1901. In the parish magazine of the same year, it was recorded that the parish of Ferryhill included St Lukes, St Columba’s of East Howle, Chilton Iron Church (built in 1877), and Windlestone Mission Church. In 1902, Balchow & Vaughan Co. Ltd sank Dean & Chapter Colliery. In 1903, St. Luke’s Church was partially rebuilt after storm damage, at a cost of £500. In 1904, Mainsforth Colliery was sunk. In the same year, Dean & Chapter Colliery went into production. In 1907, the Independent Methodist Church was built. In 1908, Dean Bank School was built to house 470 boys, 470 girls, and 380 infants. Mr G Briggs was the headmaster, and Mrs M Foster was the headmistress. 1n 1909, the Station Infants School was built to house 200 children. Mrs L Rutherford was the headmistress. In 1913, Connan Lomax & Co., Ltd built St. Luke’s Church Hall. In the same year, the Broom School was built to house 312 children. Mr T Nailor was the headmaster, and Mrs A Jackson was the headmistress. Between 1914 and 1918 was the First World War. In 1914, the terraced housing in Dean Bank was built to accommodate the miners from Dean & Chapter Colliery. There were 999 houses, and a chapel to seat 600 people. A police station was also built to employ 1 sergeant and 6 constables at St. Cuthbert’s Terrace, but in the early 1970’s it was relocated in Church Lane. The former becoming a private family house. The building work was completely finished in 1916. Human remains were earthed at what is now the entrance to the Cleves Cross Housing Estate. 1n 1917, a flu epidemic hit the village and killed scores of people. Nearly every family suffered a death. In the 1920’s, the local council straightened the old Merrington Road. In the same period, some up-hill roads were cut off by snowy weather conditions. These roads weren’t used until the conditions had cleared. In 1923, Jun. 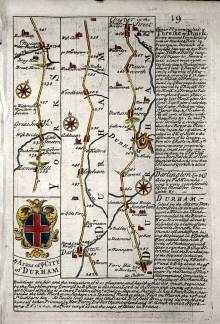 30, the Ferryhill Cut finally was opened as a road, linking both the Durham and Darlington roads together, at a cost of £49000. This enabled the increasing volume and flow of traffic on the ‘Great North Road’ to by-pass the village centre. It took almost five years to complete it. In 1925, a 1914 – 18 War memorial was erected to be built in the Town Hall Garden Grounds. In 1925, Nov. 1, a fund was raised to build a Roman Catholic Church. In 1926, a mining strike heralded the start of a depression that made over half the population of Ferryhill unemployed. In 1926, Oct. 26, the Foundation Stone was laid for the Catholic Church, at Dean Road. On Dec. 31, a total of £900 3S 4½ d had been raised for construction of the church. In 1927, Jun. 21, The Catholic Church was complete, officially opened, and blessed by Bishop Thorman. Father J L Power was the first parish priest. Murder - In 1928, a murder was committed at Lloyds Bank, next to the Black Bull Public House. Mr Abbey, the Bank Manager, had his throat cut and was murdered by Norman Elliott, who was later caught by the police whilst he was on his way home in Kelloe. Mr Abbey’s funeral was held on the 21st of February. The original fire department of Ferryhill was located on the south side of the Town Hall. It was said that most people mistook it for a garage. In the late 1960s’, it was located at the bottom of Darlington Road, but during the early 1990s’, it was relocated at Spennymoor. In the 1930s’, five picture houses were built in Ferryhill. In 1930, Dean & Chapter Coal Works closed down. Schools in the town began a scheme to clothe the children of Ferryhill, during the depression. The Dean Bank Zion Chapel ran a communal kitchen were the children were given a mid-day meal. n 1938. Oct. 19, the Working Men’s Club caught fire, and was closed for 12 months. Between 1939 and 1945 was the Second World War. In 1939, a colony of Nissan huts were erected behind the Post Office in Dean Road, to house miners who were drafted in to work the mines. In 1939, Oct. 21, the Working Men’s Club re-opened. In 1946, both Dean & Chapter, and Mainsforth mines were nationalised. In 1951, the Broom School held a festival to commemorate the Festival of Britain. In 1958, Jun. 28, the concert room was opened in the Working Men’s Club. 1. 2 picture houses were closed down. 3 were changed into gymnastic centres, bingo halls, and concert rooms. The Pavillion picture house stood empty for ten years, before been used as an amusement arcade, and bingo hall. 2. A large public library was erected at its present site. The former library within the Town Hall was changed into a conference room. 3. The Wheatsheaf public house was once a local courthouse. Upon demolition in the late 1960s’, a number of Judges’ robes and wigs were found in a basement storeroom, concealed. In 1962, Dr Beeching, Minister in charge of railways, decided to close down a vast amount of railway stations throughout England – Ferryhill was included. However due to public opinion, the closure was deferred until a year later, when it became a goods station only. In 1969, it burnt down. 1964. Sept. 12, the lounge was opened in the Working Men’s Club. In 1964, Ferryhill Grammar School – now Ferryhill Comprehensive School, was built near the Old Aged Miners Homes, on Merrington Road, to house 600 children. Mr J L Bowman was the headmaster. In 1966, Dean & Chapter was officially closed, and was demolished in the early 1970s’. In the late 1970s’, the original bus stations in the market area of Ferryhill were demolished, and replaced within the centre. 1985: Ferryhill Grammar School was enlarged, and renamed Ferryhill Comprehensive School. The school now took on Chilton, Ferryhill, and Ferryhill Station pupils. Chilton, and Ferryhill Station Schools became closed and demolished. Between the late 1980s and early 1990s, two bingo halls became closed, all except the Pavillion bingo hall. 1993: The Dean Bank Chat and Craft Group decided to work on a tapestry, to celebrate the “European Year of the Older Person and Solidarity between Generations” The work was undertaken at the Dean Bank Grange. Upon its completion, the Dean Bank panel, which was one of nine Durham County tapestries woven, were all shown in County Hall, Durham City, then a tour of libraries and galleries in the county. During 1995 the whole exhibition did a European tour, and ended with a display in the European Parliament Press Office in Strasbourg. Now the Ferryhill’s “woven image” is on permanent display in Ferryhill Branch Library. The only mishap took place at Darlington Art Gallery, when it became stolen overnight. It was found some weeks later at a Darlington second-hand shop, in good shape, for sale, priced £6. In 1996, Sedgefield District Council consisted two safety islands for the public, in Ferryhill. One near Dean Bank Primary School, and the other near Ferryhill Comprehensive School. In 1998, Sedgefield District Council demolished the old public conveniences, and in its place was built a council office, which was at the top of Durham Road. The 16th Century Manor House at the east end of Ferryhill, had its name changed to the ‘Badger’s Set Hotel’, still under the ownership of the Saunders family for 10 years. It is now back to its original name: "The Manor House". Ferryhill Public Library closed for refurbishment and modernisation between: 10 October 1998, and re-opened on 25 January 1999. A service was provided during this time from a mobile library, which was situated within the market square.